In a double boiler* melt the coconut oil, beeswax and lanolin. As soon as they are melted add the salt, clay and baking soda. Remove from heat and allow to cool. I’m always impatient so I remove my bowl from the double boiler set up and put it in a bowl of ice water to chill it, but you can also allow it to cool at room temperature. Stir occasionally so the bottom doesn’t harden while the top stays hot (you wont be able to mix in your final ingredients otherwise). When the mixture is about skin temp, add the lotion and essential oil mix and stir. Pour into your mold. Allow to set. Enjoy. If for whatever reason it is too soft or hard you can at the lowest temperature possible remelt it and add a little more lotion to soften it or a little more beeswax (melted separately) to harden it, but this ratio works pretty well for me. 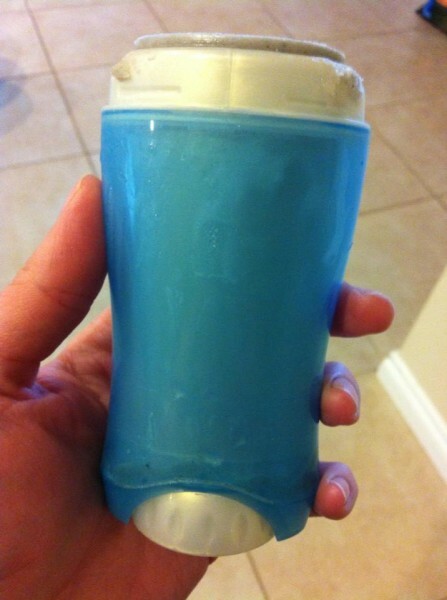 To reuse an old deodorant dispenser: First twist dial until the plastic level inside is at the very bottom, then pop the bottom off. The twist dial, the stick, level, and the bottom of the deodorant bottle will pop completely off the deodorant container. Look for a seem in the plastic about 1/5 up from the bottom insert the tip of a knife (carefully please) give the knife little twist and the entire bottom should pop off. Wash every part of the bottle really well with hot water, soap and a tooth brush. Dry the container. To fill it, place a couple pieces of packing tape over the top (the part that dispenses/rubs on your armpit) and make sure it has a very good seal. Turn it upside down and it fill it 3/4 way full. Reinsert the bottom (with all of it’s components) and pop it into place. Set/chill it upside down until hard. Remove tape. *I use a glass bowl over a small pot of simmering water, since I include bentonite clay and a silicone spatula…no metal please.